With the improving quality of smartphone videos and the realization that video can be a great way to present products online you see more and more people using it. But the quality of those videos can be appalling, with shaky, choppy video that does more harm than good. If you want to use video to present items online you’d better make sure the video you upload is pleasant to look at. And for personal use the dedicated video camera is also being replaced by our smartphones. So creating a good looking video with a smartphone is more and more important for us. Klik hier voor de Nederlandse versie van deze review! 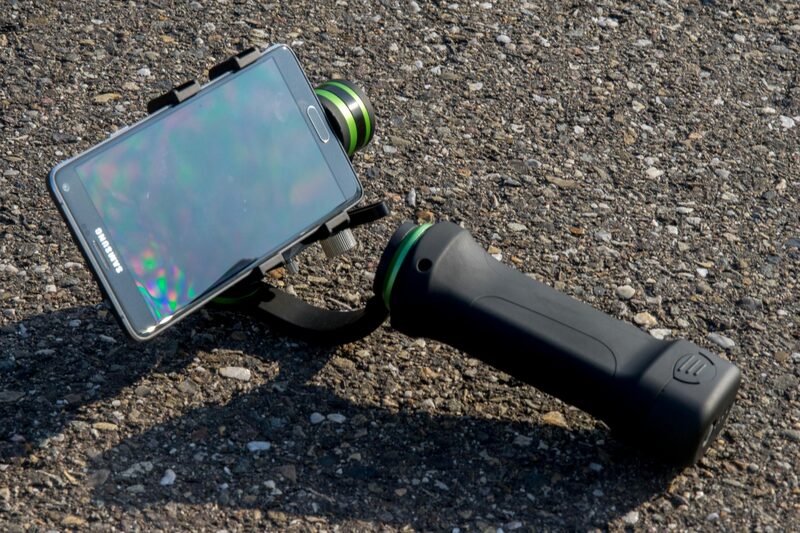 Lanparte has brought us the Lanparte HHG-01, to improve the quality of your smartphone and GoPro video’s. 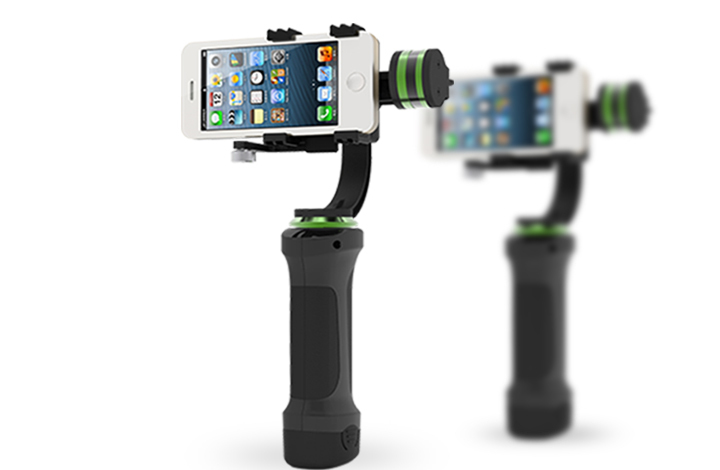 The HHG-01 (which stands for HandHeld Gimbal) is a compact handheld video stabiliser. This will be the perfect gadget for car salesmen or real estate agents who want to present their cars or houses in a professional looking video. But it could also be a nice add-on for wedding videographers, that use a smartphone as a second or third camera for candid shots, but still need professional looking smooth video to add in with the DSLR shots. And of course it will appeal to the gadgetlovers or people that want to capture their lives with their phone instead of lugging around a dedicated video camera. In this review I’ll tell you more about the HHG-01 and how it works, I’ll add a few videos I’ve shot with my iPhone 5c and my Samsung Galaxy Note 4 to show you the results you can expect with the HHG-01. The main part of the HHG-01 is the big grip you use to hold the unit. In the grip you’ll find the battery. On top of the grip there is a big, rotating arm with two motors in rotating points. At the end of the arm there is a head that holds some of the electronics and the mount that holds your smartphone. The HHG-01 has got motors in three places, one in the grip and two in the arms. The motor in the grip is used to rotate the arm left and right. The two other motors are used to compensate for unwanted movement and keep your smartphone leveled. The grip of the HHG-01 is made of durable plastic with a grippy rubberized coating. The grip also hold the large battery. You can take the battery out by pushing the two buttons on the sides of the battery and slide it out of the bottom of the unit. The battery has got some extra functions. On the bottom of it you’ll find the on/off button and four LED’s that indicate the charge level of the battery, and indicate problems or show when the unit is calibrating. To charge the battery you just take it out of the HHG-01 and insert the charger on the top of the battery. So you don’t need the HHG-01 to charge the batteries, which comes in handy if you have two or more batteries. The arms of the HHG-01 are made of an aluminium alloy, that feels strong but is still quite light. It needs to be light because the weight of the arms has to be stabilized by the unit, so the heavier they are the more energy you’ll use. The motors have nice looking metallic green stripes on them, just like the head of the HHG-01. This does complement the look of the unit. The head is made of the same plastic as the grip is. You attach the clamp to hold your smartphone or GoPro to the head. It is held on by a few clips, and secured with two small Allen screws. There are three different clips for the HHG-01, one for small smartphones (iPhone 4, 5 and similar size), for large smartphones (Samsung Note, iPhone 6 plus etc.) and a clamp for a GoPro. The smartphones are held by the clamps with a spring that keeps pressure on the phone. This means the fit is tight and secure, and because of the rubberized coating on the clamps you don’t have worry about the clamps damaging your phone. The clamp shown here is the big smartphone clamp I’ve used with my Note 4. On the bottom of the head there also is a little arm with a counterweight. That is used to stabilize the phone. By doing so the HHG-01 doesn’t have to work as hard to keep the phone levelled, so making sure the balance is good by default will save your battery. The HHG-01 comes in a nice carrying bag, to store the unit and keep it safe while transporting it. In the bag there is a foam insert with a precise cut-out to keep the HHG-01 in its place. The only downside to the cut-out is that it is quite tight, so you have to be a little gentle when you take it out of the bag. The bag is big enough to store the charger and one extra clamp. Using the HHG-01 is easy. Everybody I gave the unit was able to use it without any instructions. The only thing you have to find out is how far you can move it left or right. You can move it left to right in about a 180 degree range, if you go past 90 degrees in one direction it will go mad and start moving around uncontrollably. If you have your phone mounted and you have set the counter weight to stabilize it you just turn the unit on and let it calibrate. In about 1-2 seconds the unit will have the smartphone leveled. I’ve used a level-app to check the precision of the HHG-01, and it is quite impressive. It keeps the phone leveled within about 0.5-1 degrees, even when you are moving around. In the following video you can see the HHG-01 working to keep my phone leveled. The unit will stabilize movement in almost all directions. It can’t completely stabilize up and down movement like some professional units can. When you are walking you do create that motion, but by cleverly compensating in the other directions it does take most of it away as you can see in the video I shot with my iPhone. Even a video you have shot while walking is usable and pleasant to look at. If you don’t use a stabilizer you may get seasick viewers, and most people will stop watching. The HHG-01 can also help you create smooth pans in both horizontal and vertical direction. By rotating you wrist the HHG-01 will follow you movement in a smooth and even motion, that will look very good. It does the same in vertical pans. Of course the reach of the motion is limited, so you can’t rotate 360 degrees in one motion using the panning function. You can of course turn around yourself, and let the stabilizer do its job. The following video was shot using the Lanparte HHG-01 with my iPhone 5c with software stabilization activated. The small video in the corner was shot without the HHG-01 to show you the effect of the HHG-01. In both videos I’ve walked as smooth as I can. Even though the HHG-01 is very effective on its own, the best results are created by using the HHG-01 with a phone that has got built in soft- and hardware stabilization. As you can see in the following clip I’ve shot with my Samsung Galaxy Note 4, with the hardware stabilized lens and software stabilization activated. Of course you can also use software to apply extra stabilization to the video in post processing if you smartphone doesn’t have stabilization built in. Battery life is very good. I’ve shot hours of video with the HHG-01 on just one charge of the battery. The battery life is better with lighter smartphones like my iPhone, as the unit doesn’t have to work as hard to keep the phone leveled. Using my Note 4 (with the extra heavy wireless charging back cover) you do notice to motors getting warmer than with the iPhone. I had to switch the position of the counterweight to accommodate the large Note 4, and have put it on backwards. The mounting plate has got several mounting holes, so that isn’t a problem at all. The Lanparte HHG-01 is a great gadget that can also be used professionally in a variety of situations. Because of the price (about 300 euro’s) it isn’t out of reach of ‘normal’ consumers looking to upgrade their smartphone videos. Using it is easy, but it does take some practice to use it to its full potential. The unit is small, and lightweight enough to take with you on a daytrip, and the results are more than pleasing. It isn’t a replacement for something like the DJI Ronin, as the HHG-01 can’t really compensate for up and down motion (but still delivers a very acceptable result). But on the other hand, the Ronin is about 10 times as expensive as the Lanparte, and about 10 times as big and impractical. And the Ronin is built for bigger cameras / video cameras while the Lanparte is built for smartphones and GoPro’s. I did hear a rumour that Lanparte is developing a HHG-01 built for mirrorless cameras, how cool would that be? For now, the Lanparte is a great tool, and delivers great performance especially if you take the relatively low price in account. Thanks for a very good review, my wife/santa getting me one for Christmas. Thanks again and seasons best regards. Hi Allen, thanks for the kind words! Sounds like your Santa is one to keep! Have fun with the Lanparte, it’s a great gimbal! Hey Rick. I have a GoPro Hero+ which cannot be removed from it’s waterproof case. Do you know if the GoPro mount will accommodate? 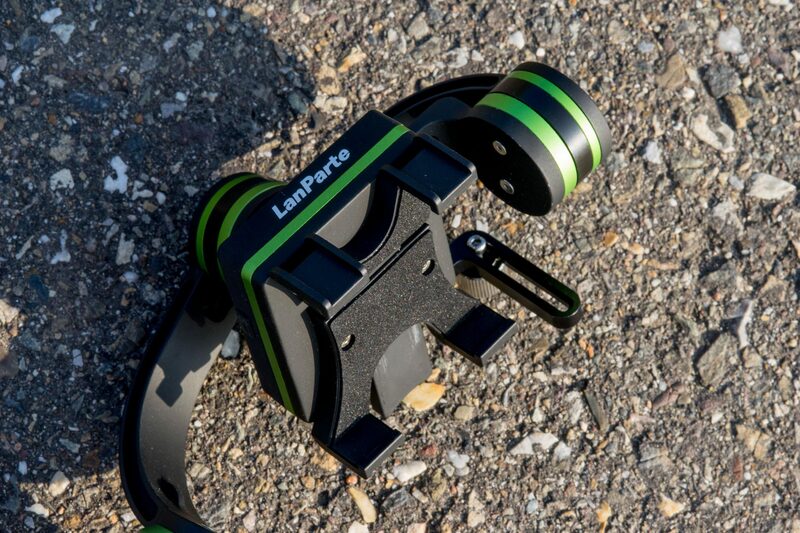 I’m 100% sold on the Lanparte for my iPhone but would rather it fit both phone or GoPro. Thanks for your reply and complement! I don’t have the Lanparte anymore, so I can’t test it for you. As I remember the mount only had space for the GoPro without the a case. If I where you I’d ask Lanparte before buying, it would be a shame if it doesn’t fit!